More celebratory cakes! A belated birthday cake. 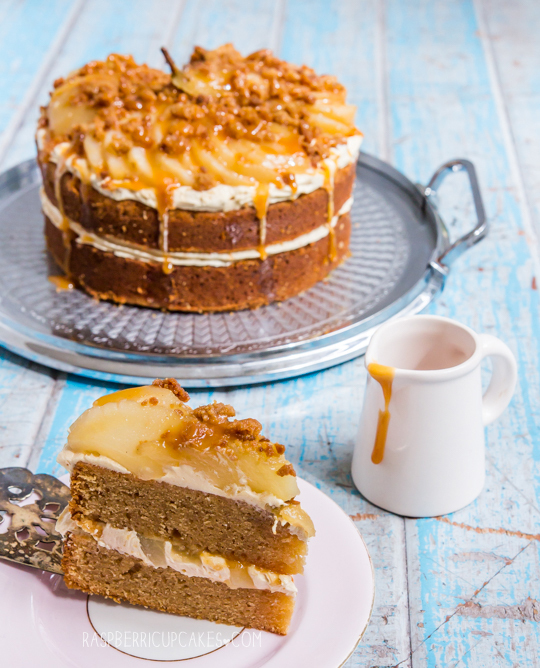 I was offered the challenge of making a cake that involved pear and salted caramel and I can rarely say no to a challenge. My friend is not a fan of sponge/cream cakes. He's a big fan of mud cakes, especially caramel ones. A couple of years ago I attempted to make him one and it was one of my first mud cake attempts. It wasn't the best, totally overbaked and brick-like. But this time I think I got it just right. I haven't made a secret of the fact that I am not a mud cake person. I'm scarred from many years of crappy chain bakery and dodgy supermarket mud cakes that are super dense and/or dry and tasteless. I prefer my cakes light and airy. I prefer a vanilla cake over a chocolate cake. But I really enjoyed this cake. 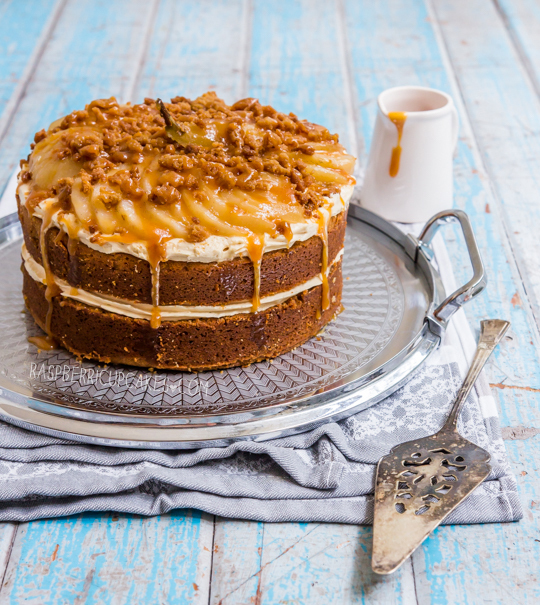 A two-layer caramel mud cake with salted caramel icing, poached vanilla bean pear, crumble and salted caramel sauce. It's INTENSE. It was my first time poaching pears! They turned out beautifully tender and matched so well with the buttery crumble that I sprinkled on top. I poached them in a brown sugar, vanilla bean and star anise mixture. I know the cake is a little on the brown and messy side presentation-wise, but don't let its appearance fool you. 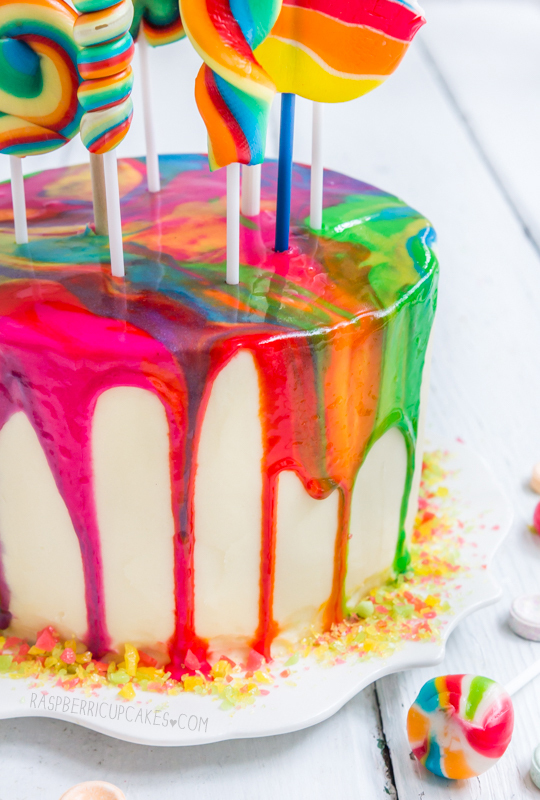 All the elements combine to make a pretty spectacular cake. 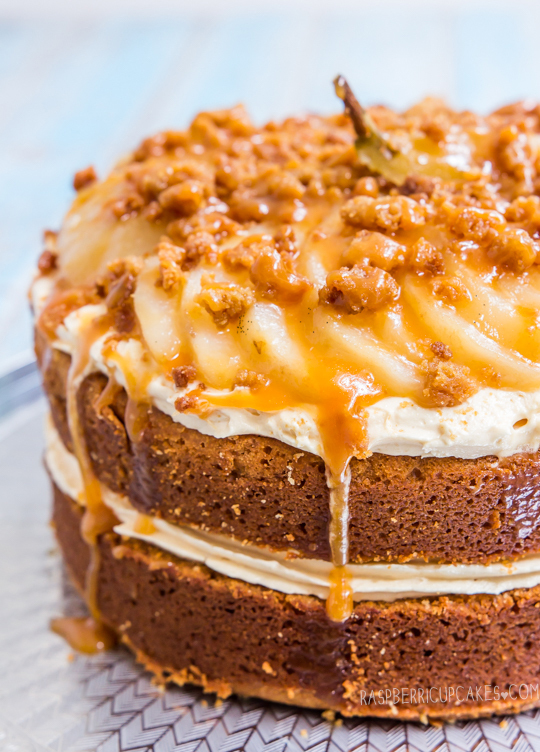 I'd recommend eating small slices served with extra crumble and salted caramel sauce and a really big cup of hot tea. Preheat the oven to 150°C (300°F). Grease and line the base and side of a two 18cm (7 inch) round cake tins (warning: batter is quite runny so spring-form tins may leak out the bottom, it is better to use non-springform). Sift the plain and self-raising flour into a bowl and set aside. Combine the butter, white chocolate, sugar and water in a medium saucepan, whisk over low heat until the chocolate is melted and sugar is dissolved. Transfer mixture to a large bowl; cool for 15 minutes. Whisk in vanilla and eggs, then add sifted flours. Pour equal amounts of mixture into prepared tins. Bake for about 60-75 minutes or until a skewer inserted into the centre of cake comes out just clean. Cover cake loosely with foil if it is over-browning. Cool the cake in the pan covered with a clean tea towel. 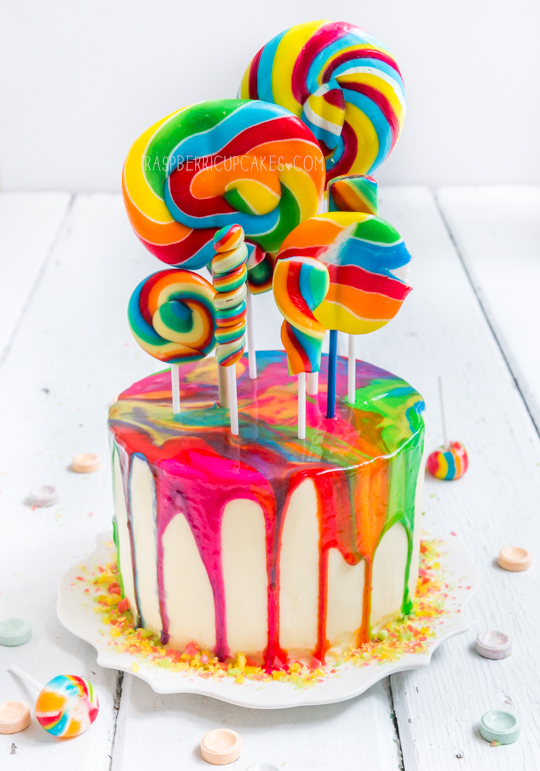 Cake can be made a day ahead and stored in an airtight container at room temp. Place sugar in a heavy-based medium to large saucepan on medium heat and whisk until it starts to melt (it may clump together but this is okay), continue whisking until all the sugar melts down. Add a sugar thermometer to the pan and continue cooking without stirring, swirl the pan occasionally to stop the bottom from burning. Heat until mixture turns dark golden in colour and the sugar thermometer reaches 180°C (350°F), then add all the butter at once. Take care as mixture will bubble up. Whisk until the butter is incorporated, then add cream (mixture will bubble up again) and whisk until smooth. Pour into a heatproof bowl. and allow to cool slightly. When cool enough to taste, add salt to taste. Cool to room temperature. Place water and sugar in a saucepan on medium high heat until sugar dissolves and mixture begins to simmer. Peel pears (keeping the stem) and place pears, vanilla pod an seeds (and star anise) in the saucepan. Simmer, turning pears occasionally to ensure even poaching, for about 20 minutes or until pears are tender (check with a fork). Carefully remove pears and set aside to cool completely, then pat very dry using paper towels. Slice pears in half and use a spoon to remove the core and seeds. Use a small sharp knife to thinly slice pears. You can keep it attached at the stem at fan out the pear slices as shown in the photos, or remove the stem and arrange the slices however you prefer. I retained one half of a pear and diced the fruit into small cubes to use inbetween the two cake layers. Spread mixture in an even layer on baking paper and bake. Check on mixture every 5 minutes, it may start to melt down into a giant thin cookie, just use a fork to break up the mixture and maintain a crumb consistency. Bake until mixture starts to go dark golden brown on the edges, ensure it does not burn. Leak on tray to cool completely. Place butter and salted caramel in a large mixing bowl and beat with an electric mixer on high until smooth and combined. Gradually add icing sugar and beat until light and fluffy. To assemble cake; trim cakes to ensure that their tops are level. Place one layer of cake (cut side up) on your cake stand/plate. Place 1 cup of salted caramel icing in a piping bag with a wide star tip attached. Pipe a circle of icing about half a cm inside from the edge of the cake, then use a spatula to spread a layer of icing inside the piped circle. (I also spread a layer, using half a pear, of small cubes of pear throughout the icing, this is optional) Sandwich with the other cake layer (cut side down) and repeat with another layer of icing. 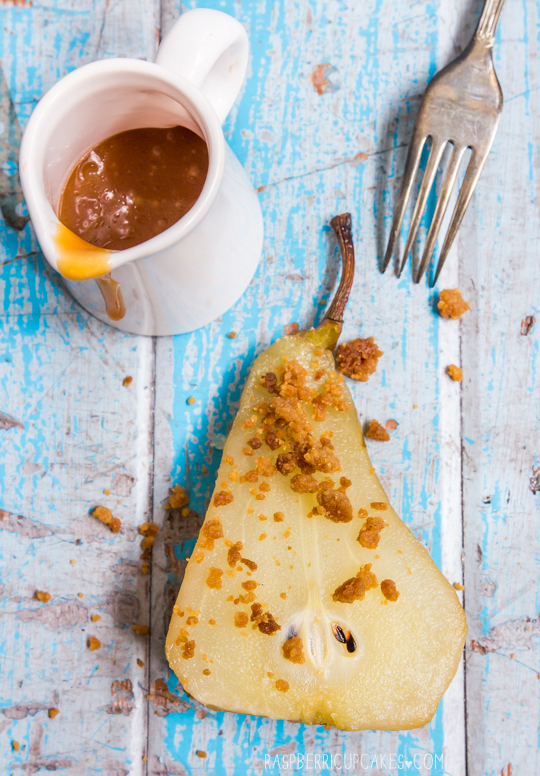 Arrange sliced pear of top and sprinkle a layer of crumble on top. Pour extra salted caramel sauce on top (you may need to warm the sauce up quickly in the microwave if it has become too thick to pour). Serve immediately. 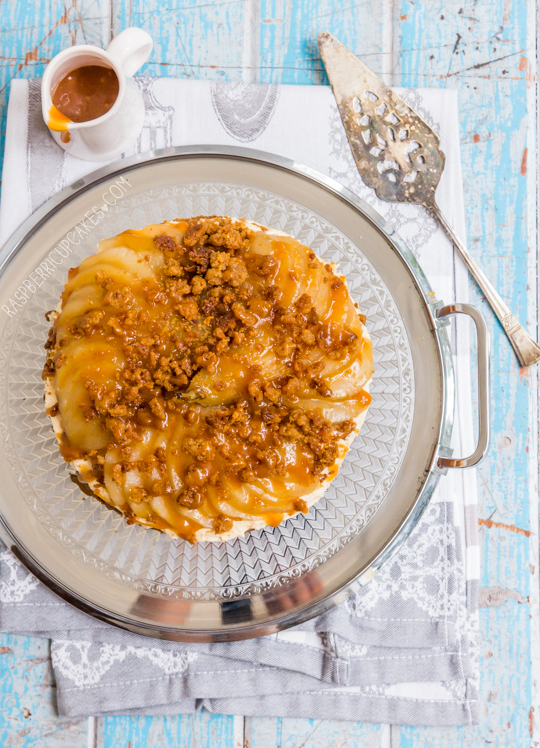 If serving layer, keep crumble and sauce separate and place on top right before serving. Phewwww, it's been a crazy week. I've been super quiet on the blog and instagram recently because everything has been full-on nutso in every other part of my life. Work, friends and home. One of the crazier things on the schedule was planning for Asian Gaga's hens night. Asian Gaga and I are complete and utter opposites in so many ways, so planning an awesome night for her and her friends presented quite a challenge. Luckily she knew pretty much exactly what she wanted, so it was just up to me to make it a reality. And my reality was always going to involve a large amount of baked goods. 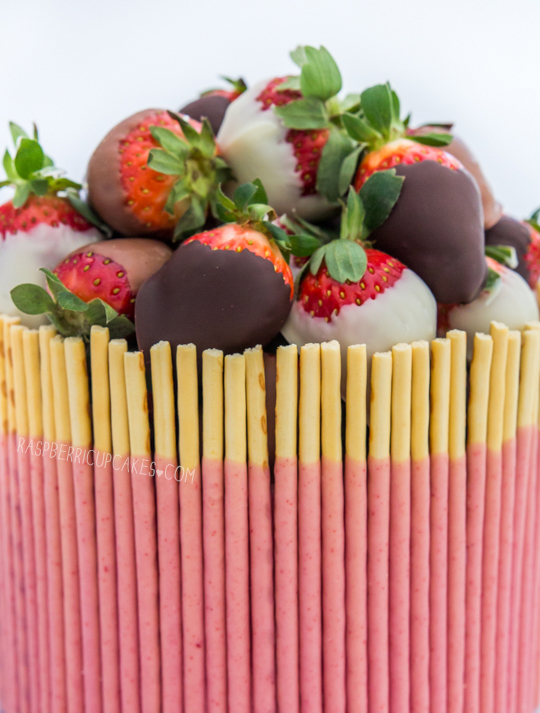 As soon as I showed Asian Gaga this gorgeous Pocky Cake from Sprinkle Bakes a couple of years ago she was in love with it. We even discussed making it as part of a wedding cake table, but it turned out to be too casual for the style of wedding she's planning. I decided that the hens night would be the perfect time to make this cake. I didn't change it up too much from the inspiration, except to go even crazier with the strawberry flavours. I added Strawberry Nesquik to the icing to make it strawberry milk icing, and topped the whole thing with a ton of chocolate-dipped strawberries. 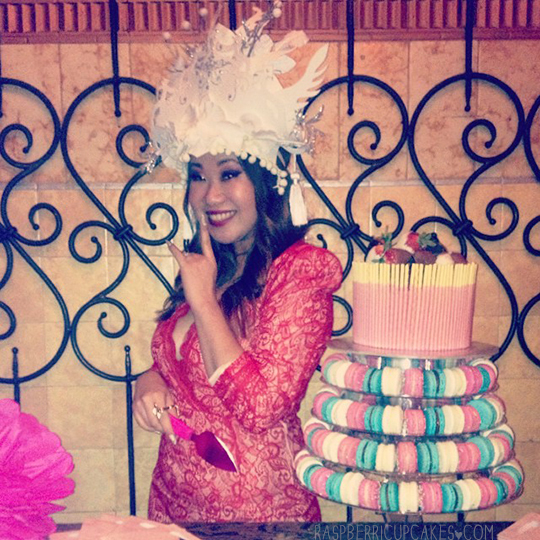 Oh, and then I put the cake on top of a macaron tower. Yes, I did make her wear that headdress. I love Etsy. So much better than a veil or a sash! Oh man, those macarons gave me grief all week. I had to make so many batches and I still wasn't happy with the texture of them. I made three flavours; strawberry jam, chocolate and Earl Grey, coconut and lychee. I totally overcatered for the night, considering that we had already had a full dinner including dessert. But better to have too much than too little, right? 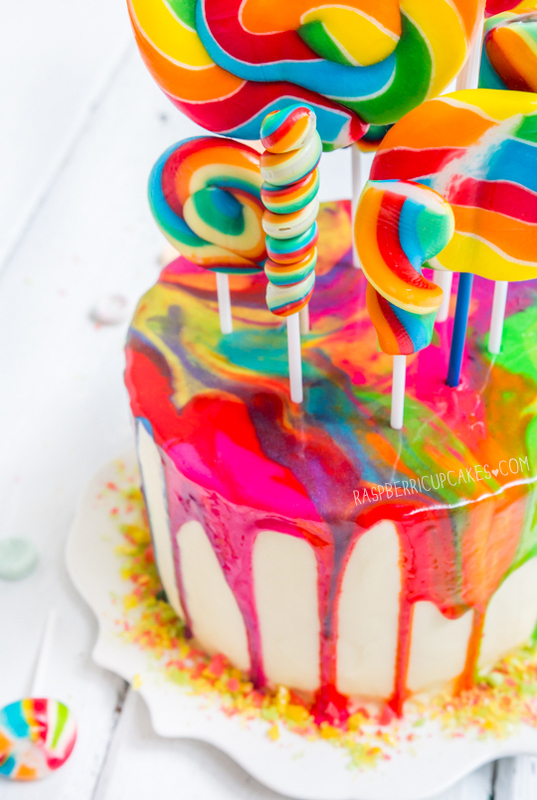 I love this cake so much. Strawberry pocky is the best thing ever. Those skinny pretzel sticks covered in strawberry chocolate smell so great. The strawberry milk icing matches it perfectly. 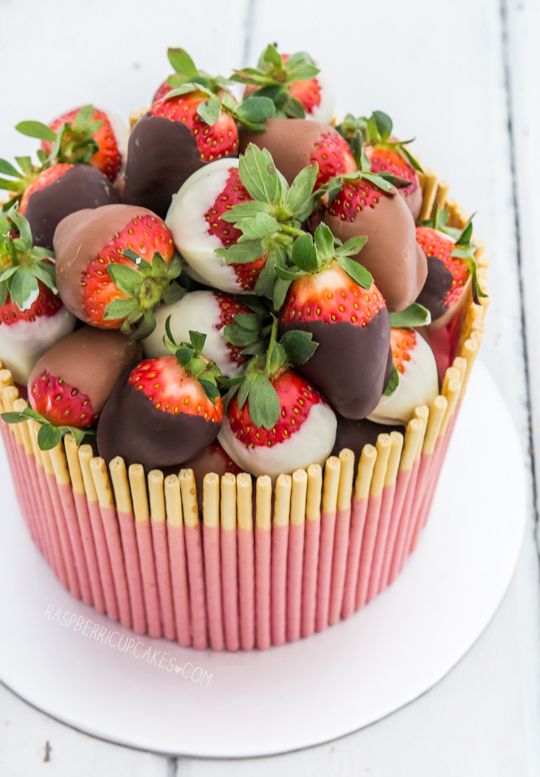 And who doesn't love chocolate-dipped strawberries? Sorry you guys don't get to see a peek of the icing and the fluffy vanilla bean cake, but I think it tasted alright. Asian Gaga loved it so my mission was accomplished. 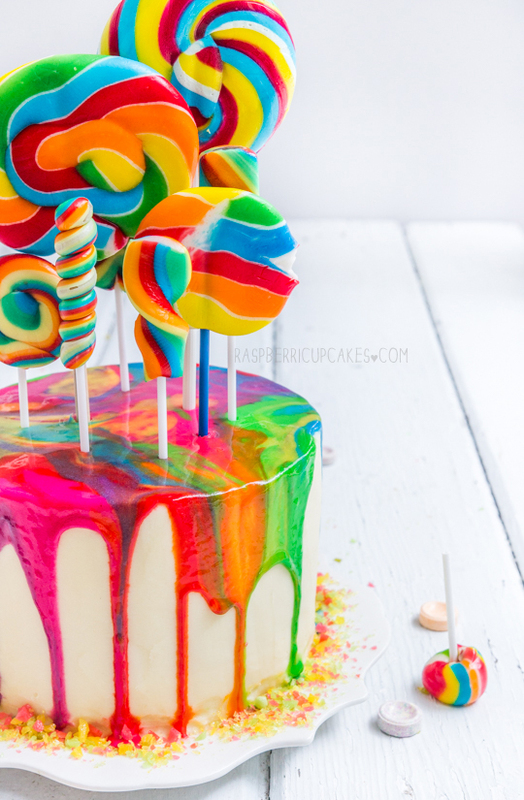 It's actually a fairly easy cake to assemble, even though it looks complicated. 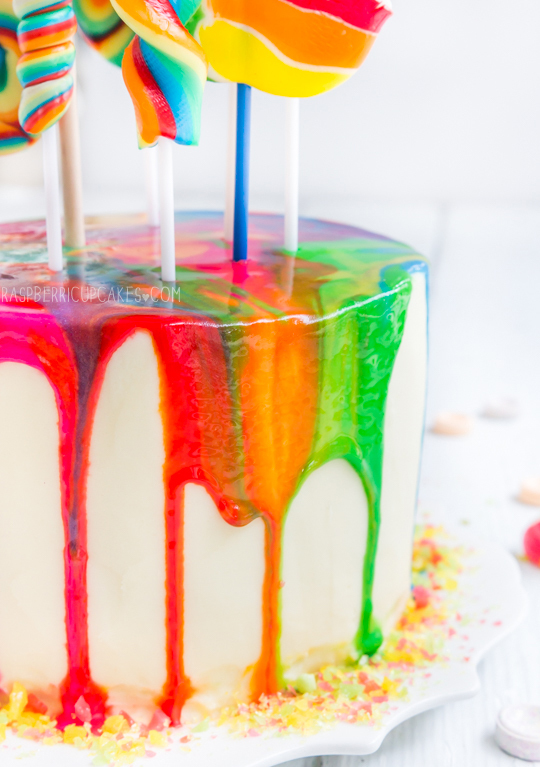 The pocky helps to cover any mistakes you may have made with your cake or icing, so no stress over making your icing smooth! 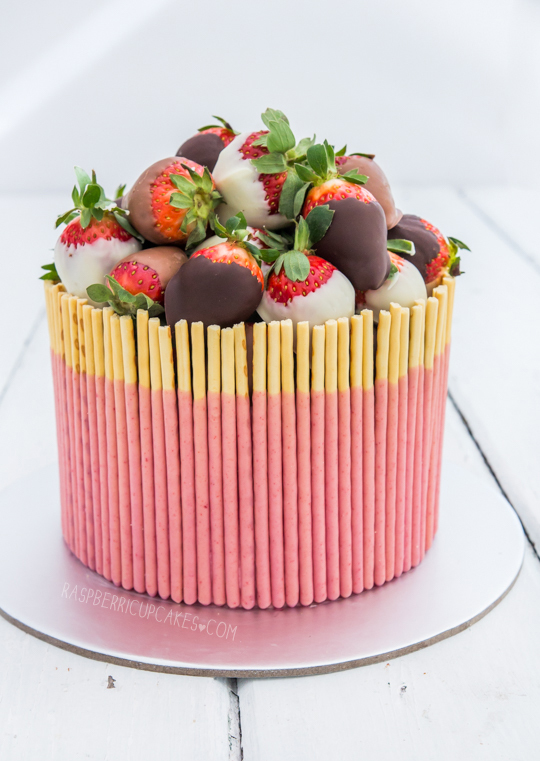 If you're a strawberry fan like me you'll love this cake. Preheat oven to 180°C (350°F) and grease two 18cm (7 inch) (or 20cm (8 inch), cake will be shorter) round cake tins. Note this will make a fairly thick cake layer so you need a tin with higher sides. If using thinner tins, split the mixture into 3 tins instead. Line the base of the tins with baking paper. Bake until a skewer inserted into the centre just comes out clean and the outside is golden, about 40-50 minutes (will vary depending on your cake tin size). Take cake not to overbake or cake will be dry. Add icing sugar, Nesquik powder to bowl and mix until it starts to come together, then gradually add milk while beating on high until light and fluffy. I added my milk 1 tbsp at a time until I achieved the desired texture. 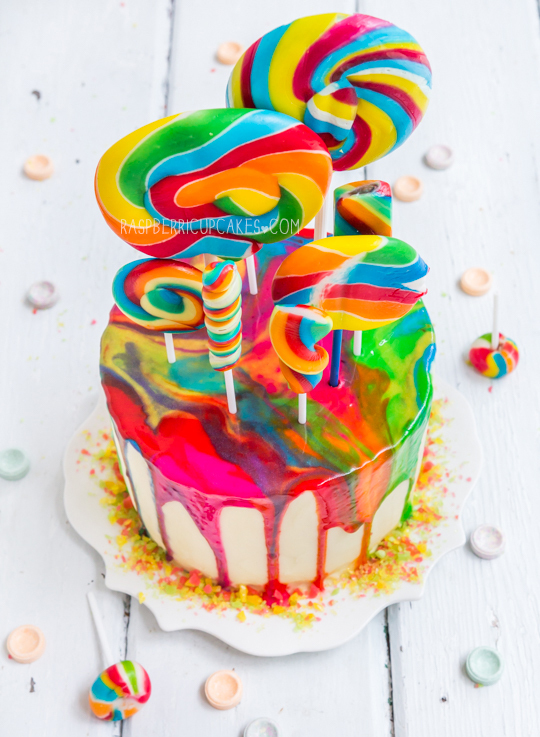 You want your icing to be stiff enough to hold its shape but smooth enough to be spread easily. Trim the tops of your cakes so they are level using a long, sharp, preferably serrated knife. 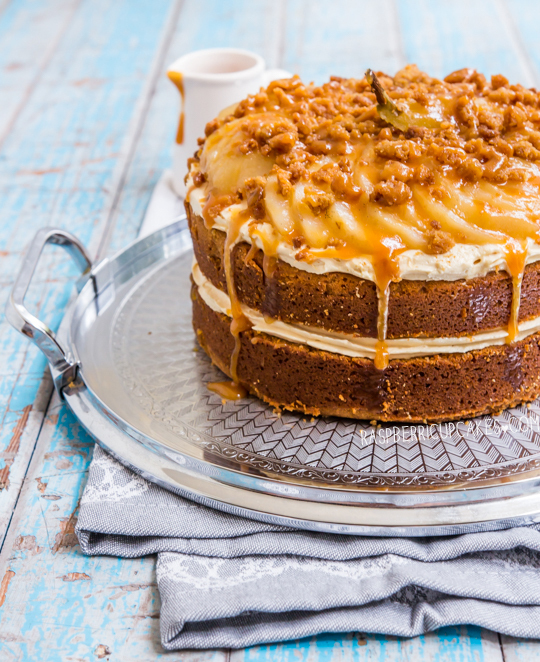 Place one layer on your cake stand and use an offset spatula to spread a thick layer of icing over the top of the cake. Sandwich with the second layer of cake. Crumb coat cake and then chill for about half an hour, then cover with remaining icing and smooth with offset spatula. 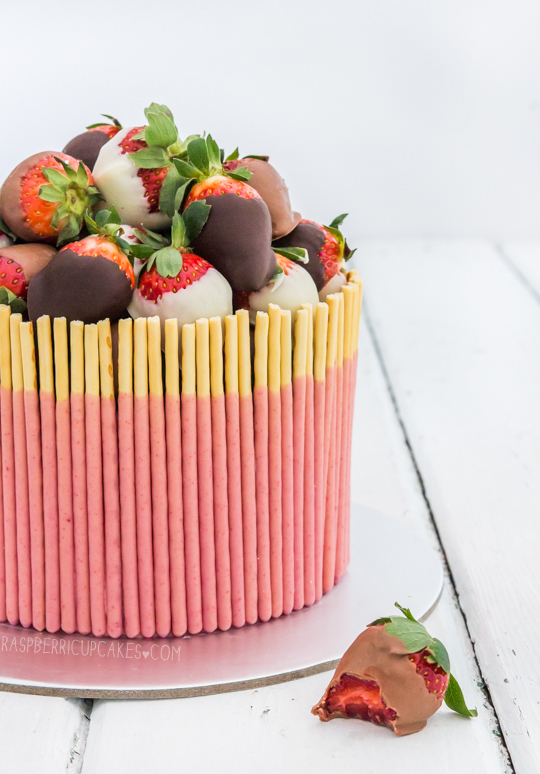 Decorate the side of the cake with pocky sticks. Carefully press the pocky into the icing on the side of the cake so that it stays in place. Chill cake to set the icing. Place cake in the fridge until ready to serve. Remove from fridge at least 15 mins before serving. 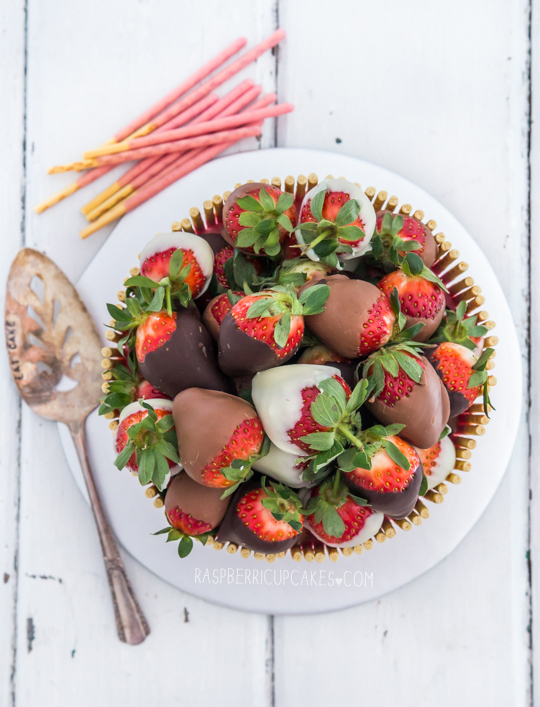 Place chocolate-dipped strawberries on top and serve.